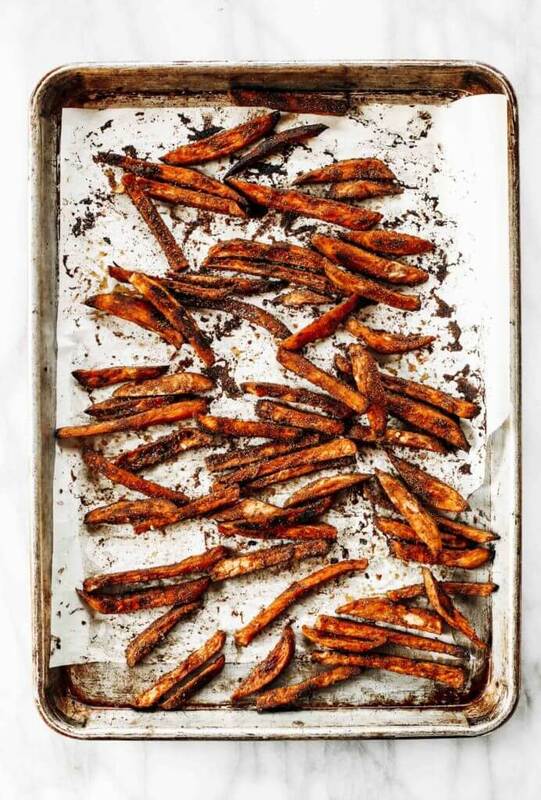 I watched these fries in the oven as the sugars from the sweet potatoes bubbled and popped. A caramel sweetness bubbled around each fry… oh man, so good. Today as I was making a batch of these fries, I kept having family members keep checking in with me to ask when these sweet potato fries were going to be ready. They happen to be a family favorite and we just can’t stay away from their savory goodness and sweet spiced flavor. Sweet potatoes have been one of my main-stays since going Paleo and every time it gets me, I never get tired of them. Especially, when sweet potatoes are made into Cumin Spiced Fries! Try and stay away. 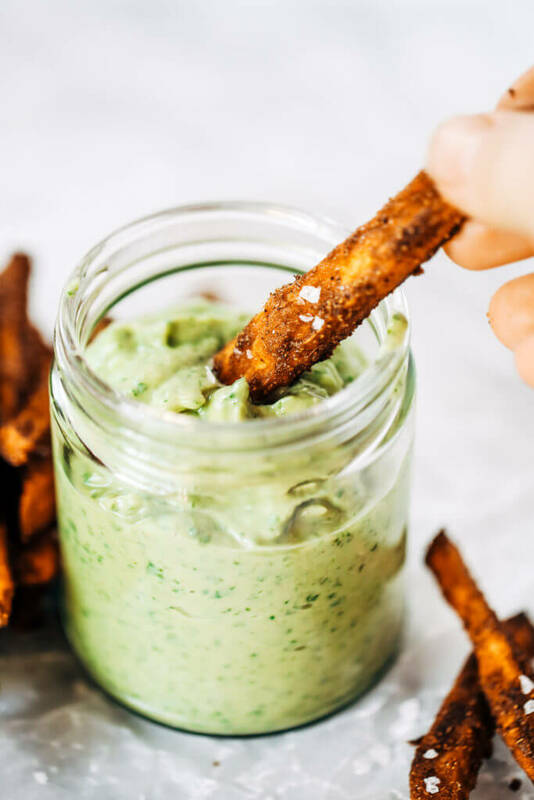 The garlic avocado dipping sauce that is served with this recipe is a recipe that I have made over and over and over again. My sister always begs me to make it when we have girls night. We will dip pretty much anything in it… roasted brussel sprouts, chips, put it on salad, fresh pepper slices, and other veggies. This dipping sauce is made in the food processor (or blender), so it only takes a handful of minutes to whip up. Dipping a warm fry into this creamy goodness makes me so happy. I just do it over and over again. To purchase a food processor, you can order one right here. Toss the sweet potatoes in the seasonings, arrowroot, and olive oil. In a food processor, combine all of the ingredients for the dipping sauce and combine until completely smooth. When I die, bury me in these sweet potato fries. These look incredible!! The aroma is wonderful while they are cooking. These fries satisfy the need to crunch crispy fries! These are exactly what I’ve been looking for! I’m excited to try them. Do you think any other types of flour besides arrowroot would work? I’m not necessarily concerned about them being paleo, just gluten free, and I don’t have any arrowroot flour on hand. I’m not seeing arrowroot in the ingredients…am I missing something? Thanks! .? Where does the ” flour” come into the recipe?? What do you use the arrow root flour for? I can’t find it anywhere in your recipe for these fries. made all of this the other week – amazing! wondering if this would all be whole30 compliment if i used whole30 mayo for dipping sauce? I adore sweet potato fries, cumin and avocado sauce. Together, it sounds like the perfect recipe! 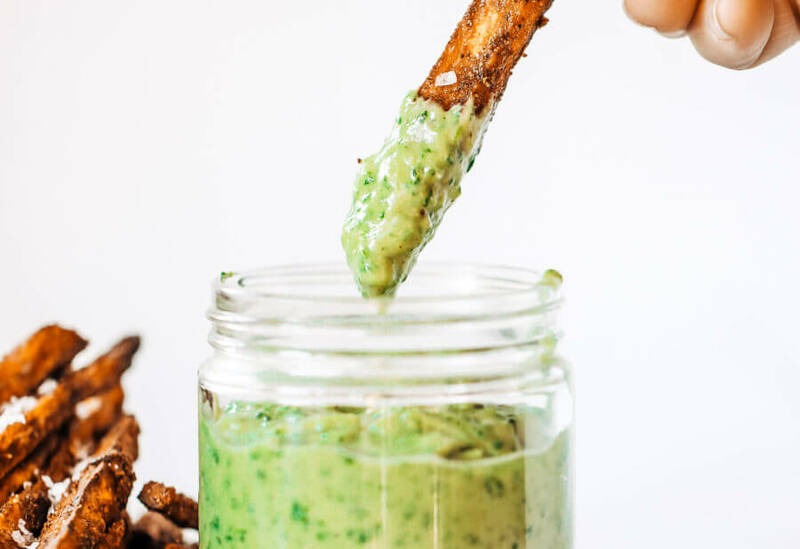 I love dipping my fries in avocado sauce but never thought of adding cumin – thanks for a great tip!